The lecture will be discussing, in a very intuitive and accessible manner, the behaviour of materials, more specifically of rocks, at different conditions of temperature and pressure, and over time and under the action of forces. Then, the difference between elastic solids and viscous liquids will be discussed, because these are the two main behaviours of rocks, from the cold and low pressure surface of the Earth to its very high temperature and very high pressure core. the behaviour of elastic, viscous and mixed visco-elastic materials like rocks will be shown using analogies and materials. To finalize this introduction, the forces acting in the Earth’s interior, and their effects will be included. Based on this knowledge of rock behaviour and forces, we will travel from the Earth’s surface down to the core, through its main layers and their mineral and mechanical properties, and along the most dynamic settings of the Earth’s interior in the framework of Plate Tectonics: mantle convection, subduction zones, continental and oceanic rifts, and unstable topographic reliefs. In the end, movies of numerical models of some fundamental processes related to Plate Tectonics will be shown. 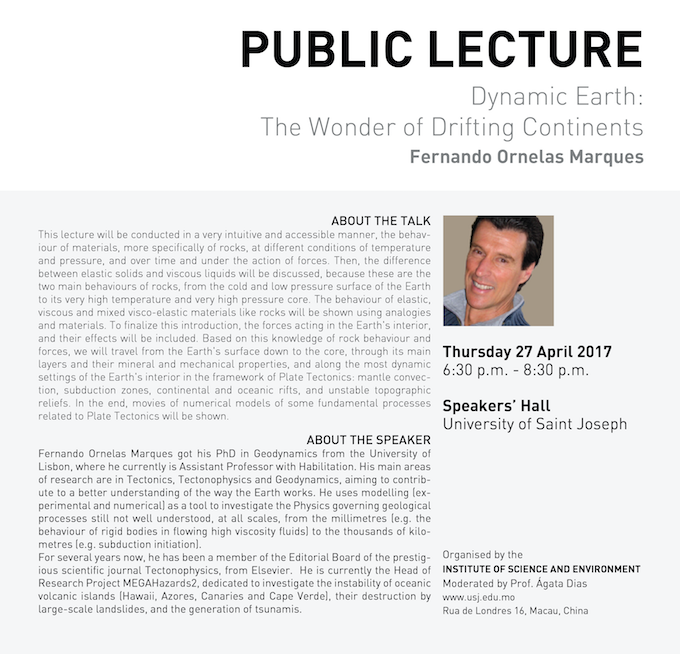 Fernando Ornelas Marques got his PhD in Geodynamics from the University of Lisbon, where he currently is Assistant Professor with Habilitation. His main areas of research are in Tectonics, Tectonophysics and Geodynamics, aiming to contribute to a better understanding of the way the Earth works. He uses modelling (experimental and numerical) as a tool to investigate the Physics governing geological processes still not well understood, at all scales, from the millimetres (e.g. the behaviour of rigid bodies in flowing high viscosity fluids) to the thousands of kilometres (e.g. subduction initiation). For several years now, he has been a member of the Editorial Board of the prestigious scientific journal Tectonophysics, from Elsevier. He is currently the Head of Research Project MEGAHazards2, dedicated to investigate the instability of oceanic volcanic islands (Hawaii, Azores, Canaries and Cape Verde), their destruction by large-scale landslides, and the generation of tsunamis.